2. Choose 'All Groups' from the left to view the list of all the imported computers. The number at the right of All Groups indicates the total number of managed computers. To view the list of computers imported to a specific group, choose the group from the left. 3. Details on all computers added will be displayed in the 'Computers' interface. Check whether all computers have been added from the 'Total' and 'Online' fields in the title bar. 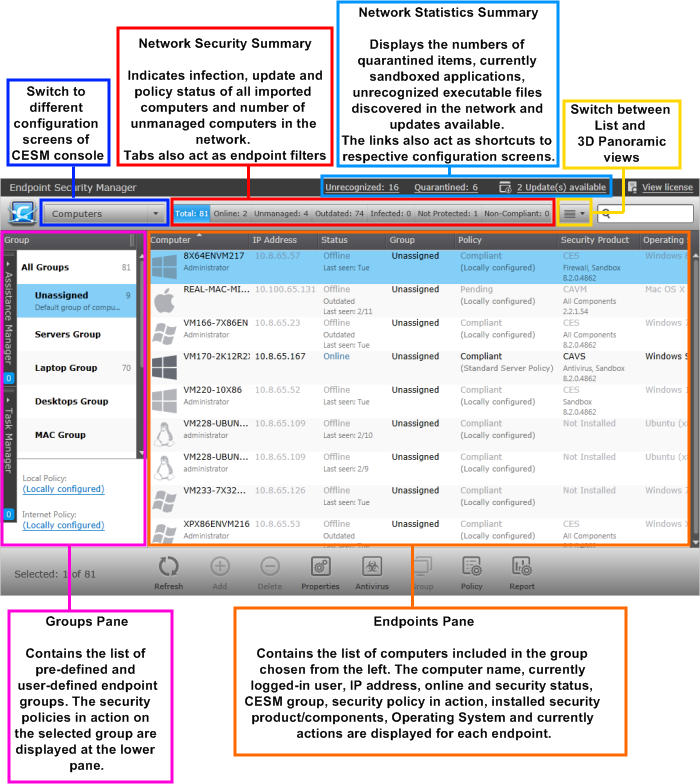 The title bar also provides a snapshot of information regarding connectivity, virus outbreaks and security policy compliance. After checking that all computers are reporting correctly, it is a good idea to make sure the latest virus database is installed. Select all the computers and click the 'Update AV' at the base of the interface. After updating, we advise running a virus scan on all computers. Select all computers and click Run a scan at the base of the interface to do this. Note - real-time AV protection is already running on all endpoints. If any malware is discovered, it will be brought to your attention via the status indicators. General advice regarding navigation and other functional areas can be found in The Administrative Console.